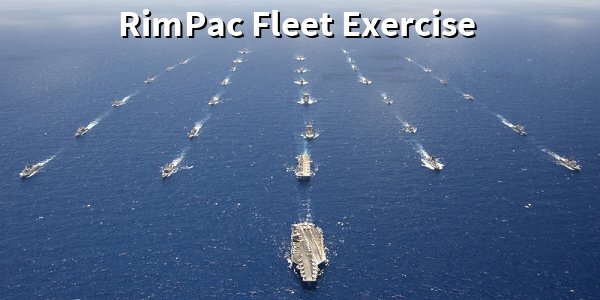 The “world’s largest international maritime exercise,” called RIMPAC 2018, was recently concluded in the waters near Hawaii. The list of nations participating in this naval exercise is very impressive, and I would observe that its unstated but obvious purpose was to prepare for a possible future war with China. The first link, second link and third link offer important details about this naval exercise as well as photos and videos of the naval maneuvers and combat activities. These links state that 25 nations participated in the naval exercise and that it included 46 surface warships, 5 five submarines, 200 warplanes, 17 land forces and 25,000 military personnel. The descriptions of the military activities practiced by the navies of the 25 nations reveal that this was no maritime “parade ground” review. It practiced real warfighting skills, such as “realistic” gunnery and missile practice, anti-submarine and air-defense drills, amphibious warfare practice, etc. When you have the navies of 25 nations practicing how to coordinate their warfighting skills, it takes such practice as this to work through language barriers, ensure that the electronics and communications of each navy are compatible with those of the other nations’ ships, etc. They would need to practice at-sea, ship-to-ship replenishment, rescue drills, etc. The three carriers involved and many of the surface combatants have helicopters on-board. The navies would need to practice landing and servicing each others’ helicopters to be able to resupply them and to carry on wartime engagements even if some helicopters had their host ships sunk in real combat. The list of activities to coordinate is almost endless. While the naval exercise included large nations such as the USA, Japan, India, Australia, etc., it also included the navies of many other countries of various sizes. Interestingly, some of the nations participating in the exercise are not located anywhere in the Pacific Region. European/NATO nations such as France, the United Kingdom, Germany and the Netherlands joined even though they are Atlantic Ocean nations. Colombia, a Gulf of Mexico nation, was present as was Brazil, a non-NATO Atlantic nation, and Israel, a Mediterranean Sea nation. The fourth link notes that four countries, Brazil, Israel, Sri Lanka and Vietnam participated in this regularly-scheduled international naval exercise for the first time. The fourth link also adds that the maritime exercise included live-fire drills, so some of the gunnery and missile firing exercises were using “live” ammunition. It is clear that these nations are practicing how to coordinate their naval warships and overall weaponry in the event of a war with China in the South China Sea or elsewhere. The European nations have a huge interest in making sure the South China Sea remains a free maritime zone for all international shipping. European businesses need to be able to send their merchant shipping through the South China Sea free of harassment or attack from Chinese warships or warplanes, so it is logical that European naval forces would be represented in this naval exercise. The same logic applies to the participation of non-Pacific nations like Colombia, Israel, and Brazil. The second link includes a mention that China was explicitly “disinvited” from the naval exercise. That makes sense since the participants are essentially practicing how to coordinate their forces in a war provoked by China. China was, understandably, very interested in this naval exercise, and it had a spy ship close by monitoring the activities as best it could. This would actually have been beneficial to the exercise as the combined fleets could also practice jamming the frequencies and electronic sensors used by the Chinese surveillance ship that was spying on them. As an indication of how serious this naval exercise was, the second link notes that representatives of the civilian merchant marine industry were also present to learn how to coordinate their vessel’s shipboard systems with the navies of the many other nations that would be protecting their ships in an actual war. The fifth link addresses the role of the British Royal Navy in the exercise. The Latin American nations of Chile, Colombia, and Brazil participated in the naval exercise. Conspicuously absent among the list of Latin American nations was Argentina, which, as the sixth link indicates, has been establishing closer ties with China in recent years. I could not help noticing in one link that a US Marine Corps General performing a leadership role in the exercise was named “General Hashimoto.” What a graphic confirmation of how close American-Japanese ties have become since World War II. RIMPAC 2018 was a major war-fighting drill with exercises on land, sea and in the air. It is an indication of how serious the threat of war between China and many other nations is becoming that such a large exercise took place. It would be great if peace and bonhomie broke out all over the world, but that is highly unlikely. Indeed, Ezekiel 38-39 identifies China as one of the nations that will be in the large Gog-Magog alliance which is prophesied to attack a large group of nations led by the modern nations of the ten tribes of “Israel.” In biblical prophetic terminology, the Jewish/Israeli nation is referred to as “Judah, not “Israel” (as Zephaniah 2 and Zechariah 12 and 14 confirm). The Israelis are not the subject of the attack in Ezekiel 38-39. To learn much more about the identity of the modern nations of the ten tribes of Israel and their allies, you can read my free articles, What Ezekiel 38-39 Reveal about a Future World War III, The USA in Bible Prophecy and Japan’s Role in Biblical Prophecy. My four printed books and one E-book about the history of the ten tribes of Israel, which include comprehensive evidence from secular history as well as biblical prophecies, are available at the home page of my website. If you read those books, you will realize that the modern nations of the world are truly acting out a “script” that was prophetically written for them millennia ago by a Creator God. If you read these articles and books, you will have an enlightening insight into the divine “script” which will unfold in the coming years.